Charles Dickens must have been thinking of social media when he so eloquently said, "It was the best of times, it was the worst of times." Without a doubt, social media levels the playing field for all businesses--large and small. It amplifies the "best of times" (and tools) for business growth for smaller business enterprises. Used ineffectively, social media assumes the form of the "worst of times" in the life of the overwhelmed small business entrepreneur. How can social media efforts be tailored to achieve your goals for business growth? Easy! Make a connection. Who hasn't received an automated LinkedIn connection request!? When I see the subject line, "I'd like to connect with you on LinkedIn," I'm tempted to send back a one-word response--why. Why, you ask? Well, it's really simple. If a connection is important enough to request, wouldn't you think it was important enough to craft a personal message? For too many that are extending the invitation, it's not...and it hurts their business growth. With little or no effort put into "connecting," opportunities to grow relationships through social media are merely a pipe dream--often expressed as, "you can't get clients from social media." Google the meaning of "connection," and you won't be at a loss for an abundance of definitions. From "establish communication between" to "associate mentally or emotionally," my favorite characterization, as it relates to business growth, is "to have or establish successful communication." NASP (National Association of Sales Professionals) featured an excellent article authored by Julie McEwen Johnson titled, "Use Social Media Sites For Their Original Purpose And You Will See Excellent Results." Like Mae West, for social media to produce results, you need to connect--and reconnect--to create relationships that contribute to the growth of your business. Connect with those who match your buyer persona. Personalize your social media invitations--without selling! Express appreciation when someone accepts your invitations and/or shares your status updates. Ask genuine questions to get to know them and their business--without selling! Build trust by following the Nine Steps to Building Trust Online and Offline for Your Small Business. Keep up with the latest developments and achievements in their business. 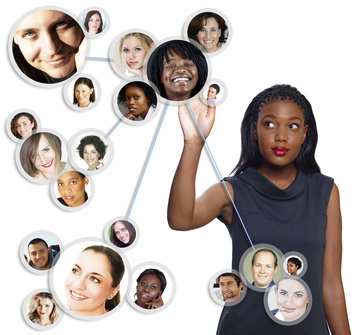 Share their social media posts and/or status updates with your network. Reach out to say "thinking of you"--without selling! Demonstrate your sincere interest in your clients--and their business--by researching their social media before meetings. If appropriate, mention it during your client meeting. Share information of value to your clients through social media. Nothing says "top of the mind" like a post that says, "I thought of you when I read this." Wish your clients well before a big event. People don't care how much you know, until they know how much you care. Social media is the perfect platform to demonstrate the value of the relationship. After all, it's the relationship that leads to business growth--not social media! These tips merely graze the tip of the iceberg. In fact, we'd love to hear how you use social media to better connect with your clients. Connect Your Way to Business Growth Through Social Media first appeared on Synnovatia.